Surrounded by bountiful countryside, “La Belle Gasconne” is set right in the heart of the Lot-et-Garonne Department. Scenic country roads lead west to Bordeaux or east to Agen and south towards the Pyrenees and Spain, this authentic millhouse embodies the very essence of Gascony. Learn 600 years of culinary secrets and create deeply delicious Gasconne dishes in authentic Gasconne kitchen that was once a Michelin star restaurant. La Belle Gasconne is a centuries old millhouse on its own island in the Gelise River. With its own private pool and park, it’s the perfect setting for outdoor dining day or night in the summer. A lot less traveled than Provence, which adds to the beautiful and unspoiled charm of the Lot-et-Garonne, which is one of the smallest départements in France. There are so many interesting places to see, and culinary adventures to be had. A proliferation of bastide towns, such as Vianne (24 km) and Laressingle 23 km, Fources, and even smaller hamlets scattered like sunflowers across the landscape give testimony to battles fought long ago. Nérac (17 km) is a pleasant riverside Ville with an attractive old quarter, barges for a leisurely cruise down the River Baïse, past Henri IV’s youthful residence, and a very fine market. Winding south to the Gers département is Condom, well known for its Armagnac chai, 30 miles to Agen and the train station. 133 km to Bordeaux, 48 miles to Auch, the capital of the Gers. 170 miles to Carcassonne. 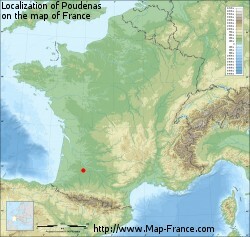 Where is Poudenas in France? Café Galerie: serves incredible artisanal pizzas and in the summer on Friday evenings roast chicken, frites and salads under the arcades. Le Coin de Marie C is a quaint little shop next door where you can enjoy select boissons and buy gifts of local delicacies.